PHUKET: The ongoing saga of Phuket’s lifeguards, or widespread lack thereof, further descended into farce last Thursday (Apr 5) with a comically inept performance by the key players aimed at reassuring the public. 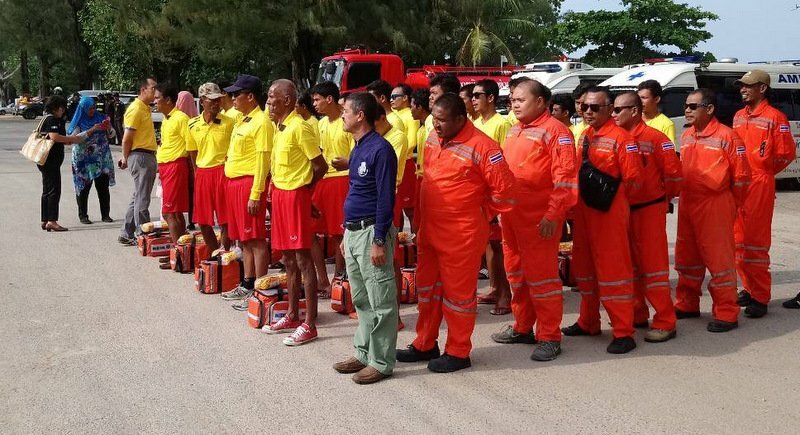 With the ongoing disaster zone that is Surin Beach as their backdrop with 27 lifeguards were presented to Phuket Governor Norraphat Plodthong by the Bangkok-based company that recently took on the contract to provide lifeguard services at the island’s beaches. It was a lovely performance by all and presented a great opportunity to photograph some of Phuket’s increasingly elusive lifeguards. Unfortunately, when it came to explaining whether the number of lifeguards currently deployed in Phuket fulfilled the requirement of the recently awarded contract both Governor Norraphat and Dr Nutpol Sirisawang, Managing Director of the lifeguards’ employer, LP Laikhum Co Ltd, seemed to suffer from a bout of acute amnesia. With the hope of jogging the Governor’s memory The Phuket News recently ran a story outlying the key elements of the contract. Perhaps the most important part of the document in question was the clearly stated requirement that there be 98 lifeguards to patrol all of Phuket’s major west coast beaches from March 1, 2018. On this key point Dr Nutpol admitted that the 27 lifeguards on show were in fact the only ones on patrol as of April 5, a month after the deadline. Furthermore, it turns out that they are only patrolling Surin, Bang Tao, Nai Thon and Mai Khao beaches. Leaving large swathes of Phuket’s popular tourist beaches devoid of lifeguards, with the Governor saying that the local authorities in those districts would now have to fend for themselves. This blatant breach of contract – and its unexplained acceptance – along with the wilful ignorance on behalf of the Governor has made a mockery of the authority of the island’s top-ranking, Bangkok-appointed official and begs the handover of responsibility for Phuket’s lifeguard service to the military or some other national organisation that has demonstrated at least minimal competence in carrying out its duties. The whole situation is a farce and surely has other countries chuckling at the sheer idiocy of it, but we here in Phuket cannot afford to laugh, as we realise how many lives are now at risk on Phuket’s beaches – which are, let’s not forget, what draws so many tourists to Phuket in the first place. i strongly suspect the first 3 guys at the front couldnt pass the bronze medallion. it looks like dads army. the usual...put em in a uniform and they are suddenly super heroes attitude that make thailand such a fake ! i would be making sure they wear life vests as they might need rescuing too. Easy solution:  Tourists and beach goers already have had their liberties taken away - no beach chair, no umbrella, no smoking, no vendors  - now just add 'no swimming' and problem solved. No need for any lifeguards at all. The only thing to do at the beach now is to rent a jet ski? - no problem. The 5 men in overall orange uniform are not beach life guards. Are they the crew of that fire truck? And what are the ambulances on backround doing there? What have fire truck and ambulances to do with Beach lifeguard setting? Time to send in the navy and let the new submarines come to use. Amazing Thailand. How can the authorities allow this farce to happen, and apparently no repercussions for anyone? Hopeless.